A modern take on the classic Kunai knife! 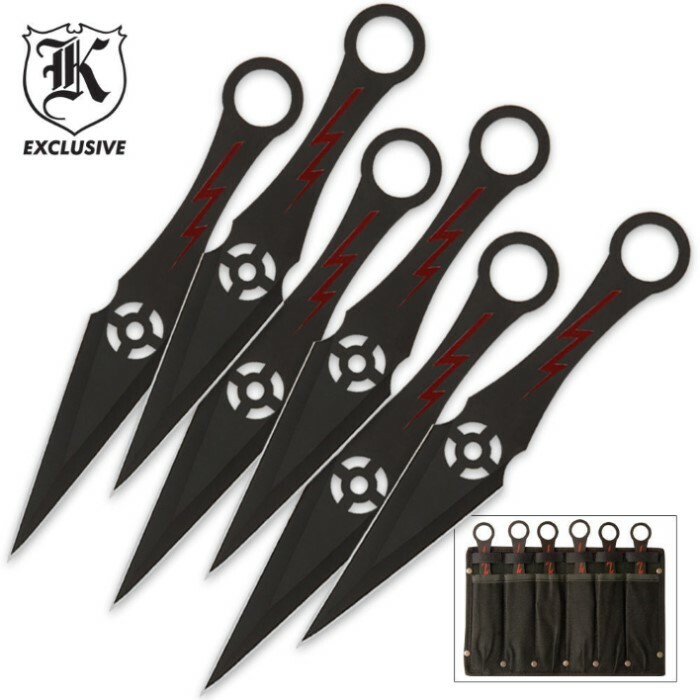 This set of 6 throwing knives are crafted from solid stainless steel with orbital cut out, finished in black, and feature a red bolt of lightening down the handle. Each measures 7 1/2 in. overall. A black nylon sheath with leg straps is included. 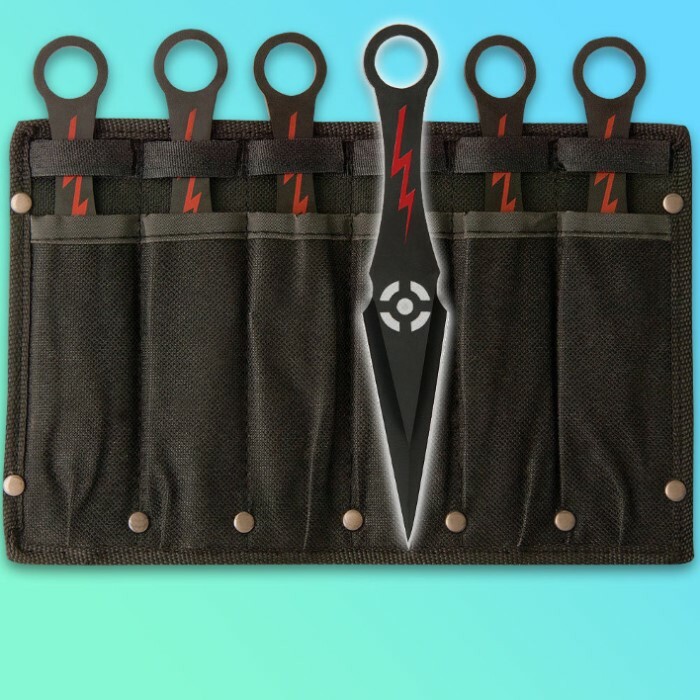 I love this throwing knives and they are the best in my, small, collection. The tips bend but can easily be fixed. My main issue is the leg sheath. The straps are too loose and aren't adjustable at all, I had to get my own straps just to keep it from falling off. The knives stab through the sheath entirely and I had to get rid of it. The blades are amazing though and are beautifully balanced. Buy for the sheath, stay for the knives. I've had these knives for 3 years and I am buying another set. I have sharpened them a few times but thats because I am rough on them. They are good steel and I modified the nylon sheath, but I thought it due diligence to leave a review for a good product. Thanks BudK!! sharp and balanced throwing knives for the price! I received my knifes today and i must say they are well made, nice and sharp and very light. The only problem i have is with the sheath, The leg straps don't exactly hold the sheath to my leg but other then that awesome knifes! Wonderful knives. The tips are rather weak though. They were bending even when sinking in the target, but pounded out pretty easily. Great buy! I was kind of nervous getting this because the price was so low, but when I stuck one right into my o' Blue Spruce, I was ecstatic. Flies through the air with ease and lands almost silently. Couldn't be happier and will be back for more. Thank you TrueSwords!